The dental implant is by far one of the biggest breakthroughs to come about in dentistry. Dental implants offer a permanent, completely natural looking solution for one or more missing teeth. For the first time, the replacement for missing teeth can also be as strong or stronger than the original. 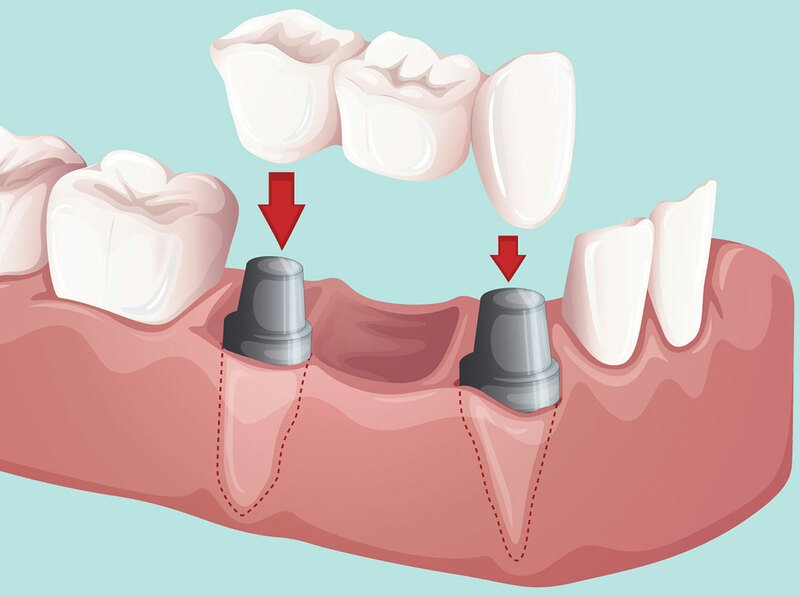 A crown is placed on top of an implant to provide a tooth-like shape and structure for function. Porcelain or ceramic crowns can be matched to the color of your natural teeth. Other materials include gold and metal alloys, acrylic and ceramic. These alloys are generally stronger than porcelain. Porcelain bonded to a metal shell is often used because it is both strong and attractive. An implant-supported denture is a type of overdenture that is supported by and attached to implants. A regular denture rests on the gums, and is not supported by implants.An implant-supported denture is used when a person doesn’t have any teeth in the jaw, but has enough bone in the jaw to support implants. An implant-supported denture has special attachments that snap onto attachments on the implants. Implant-retained removable partial dentures have made treatment options available to patients who previously may not have been able to benefit from implant dentistry. A partial denture replaces one or more teeth, as opposed to a full denture, which replaces all the teeth in a jaw. Partials generally attach to the remaining teeth by means of rests and clasps. It is removable by you; it is not fixed in place in your mouth. What you need to know about Dental Implants. The dental implant is by far one of the biggest breakthroughs to come about in dentistry. Dental implants offer a permanent, completely natural looking solution for one or more missing teeth. For many years, people who lost their teeth had several choices for replacing them that simply weren’t as natural looking or long lasting as implants, such as dentures, bridges, and partials. Many denture wearers chose false teeth because they wanted to put an end to their tooth problems, but they didn’t realize that they were causing a whole new set of problems. Dentures can cause pain during eating and often don’t fit properly, leading to pain and poor nutrition. Long-term denture wearers can also lose jaw bone which causes the classic collapsed, sunken in wrinkled face common to many denture wearers. With today’s incredible implant technology, these problems can be a thing of the past. It’s no longer necessary to lack confidence in social settings or to have a reduced ability to chew. Dental implants are the answer! For the first time, the replacement for missing teeth can also be as strong or stronger than the original. Like teeth, dental implants are embedded in the jawbone. The bone actually bonds to the implants. This allows the teeth to be replaced without placing any pressure on the gums, thus eliminating the pain normally associated with dentures. Using dental implants, the upper teeth can be replaced without covering the roof of the mouth. By exposing the roof of the mouth, the former denture wearer can enjoy the subtle tastes and textures of food and drink that they have been missing out on for so many years. The best news is that the latest breakthrough in implant technology makes implant tooth replacement possible for individuals who previously weren’t candidates before. At Riverbend Dental Center, time is taken to make sure that you have the care that is right for you, and tremendous pride is taken to provide a long term, successful outcome once treatment is completed. During your consultation, Dr. Schmidt can let you know if dental implants are the answer for your particular problem. Commonly Asked Questions About Dental Implants. 1) What is an implant? 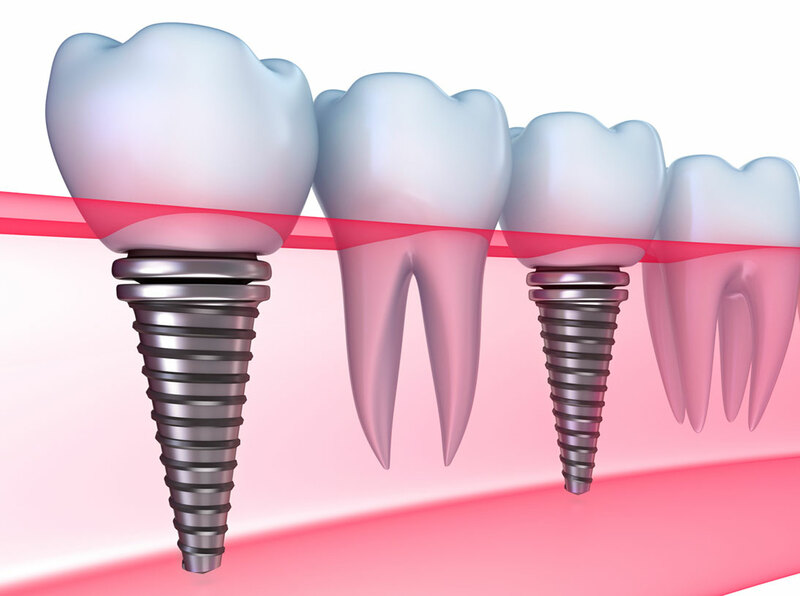 An implant is a metal post that replaces the missing root of the tooth. A crown is attached to the post, creating a permanent fixture that looks and feels like a real tooth. 2) What are implants made of? Implants are made from titanium, a biologically safe metal. They are custom designed in various shapes and sizes to fit a patient’s individual needs. 3) How much do implants cost? The fee for implants vary according to the patient’s needs. Dental implants are typically a bigger investment in the beginning, but because they can last decades and even a lifetime for some patients. Call our office for a dental implant consultation. 4) How will I benefit from dental implants? Dr. Schmidt says dental implants can literally give a patient his or her smile back, or create the kind of smile the patient has never experienced before. Today’s implants look and feel just like the real thing, and they allow the patient to once again chew properly and enjoy food. Implants also eliminate the embarrassment and inconvenience associated with removable teeth, and the also allow single missing teeth to be replaced without cutting down healthy ones. Of Americans between the ages of 18 and 64, approximately 49% are missing at least one tooth. No one can be disqualified for implant treatment solely because of their age — Some patients receive implant treatment when they are in their nineties! 5) Is this procedure painful? Most patients experience very little discomfort with the procedure. The patient is under local anesthesia during the entire procedure, and most patients do fine with an over the counter pain reliever following the procedure. 6) How long does the procedure take? 7) Will my insurance cover the implants? Many insurance carriers do not cover implant dentistry, but it depends on your particular insurance policy. Bring your policy booklet in with you and we’ll be glad to have our insurance coordinator review it. 8) How long do implants last? When your implant is placed, we have every intention of them lasting you a lifetime. While there is no way we can predict complications in the future, our success rate over the years has been excellent here at Riverbend Dental Center. 9) How long will this take? While the actual placement of the implant can sometimes be done in less than an hour, depending on your needs, the entire treatment time can range from three months to a year depending on a patient’s specific case. We will make sure you’ll be able to return to work as soon as possible, and function normally at this time. You’ll be able to wear your denture or partial during this time. 10) Is there financing available for my implants? We can arrange payment plans allowing you anywhere from 6 months to 5 years to pay off your bill for your dental implants. 11) How long will I be without any teeth or my dentures? In most cases you will be given a temporary appliance (prosthesis) that has the missing or extracted tooth (teeth) so you will not have to go without teeth. If you are a denture or partial user, you will be able to wear your dentures and/or partials for the entire time (except for a few days after implant placement). 12) How many visits will this take? The number of visits will depend on the type of treatments you will need. Dr. Schmidt will be able to answer this question after your examination appointment. 13) Will I ever be without my teeth? Immediately following the placement of the implants, we advise our patients to go without their dentures for two to three days for healing. After that time, however, you may wear your denture comfortably until the final teeth are placed. 14) Do you do these procedures in your office? Our office is fully equipped with all the equipment needed to handle every aspect of the implant placement in house, including the design and mill of the crown that’s placed on top of the implant. 15) How long have implants been done? Implants are not new to the dental field. Modern medicine began the procedure in 1948, but they have really been perfected over the past decade. Yes. The procedure is rarely more involved than having a tooth pulled and most patients do great with over the counter pain medication. 17) Will implants work for me? The best way to determine this is to have an evaluation. Call us today at (504) 861-9044 to arrange a consultation with Dr. Glenn Schmidt. 9 Major Benefits of Dental Implants. Dental Implants assist you in looking and feeling younger, because they prevent bone loss. By preventing bone loss that would normally occur with the loss of teeth, your facial structures remain normal and intact. The chances of wrinkling and the look of old age before your time is less likely. Implants prevent the bone loss that would normally occur with the loss of teeth. In other words, everyday that you continue to wear dentures, or have missing teeth, you are experiencing bone loss, which makes you look much older than you have to. By using dental implants your facial structures and jaw remains strong, healthy, and intact. This is especially important when all of the teeth are missing, because the lower one-third of the face collapses if implants are not placed to preserve the bone. You can now live longer, because you’ll get to eat better and prevent malnutrition or stomach problems! Fresh Vegetables, corn, and fruits are back on the menu! You can now eat the foods you like. Also, since your chewing is improved, your digestion will be even better as well! More Confidence in social situations. Most of our patients love their new implants, because of their improved appearance, function, comfort and health. When you go out in public, you will never have to cover your mouth with your hand, or put off eating out of fear of a denture popping out or gagging you. Also, the improved appearance of your new smile will have people giving you compliments galore. Allows you to relax and not have to worry about your dentures moving around, popping out, or gagging you. You’ll never worry about your dentures flying out when you laugh, sneeze, cough, or when you eat. Implants are so securely attached that the fear of them falling out will be eliminated! Like I said before, these will feel like they are your natural teeth. Your mouth will be restored as closely as possible to its natural state. By replacing the entire tooth, as well as the tooth root, it is possible to replicate the function of natural teeth, with a strong, stable foundation that allows comfortable biting and chewing. Also, nothing in the mouth looks or feels false or artificial! Increases the amount of enjoyment you get out of eating. You will be able to taste foods more fully. Wearing an upper denture can prevent someone from really tasting food, as the roof of the mouth is covered. With implant supported replacement teeth, it is not necessary to cover the roof of the mouth, so you can truly enjoy the taste of foods. Improves overall oral health and decrease the risk of oral cancer and heart disease. 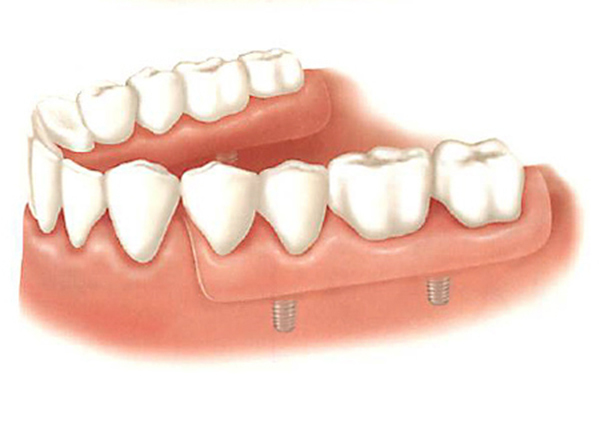 It is much easier to care for implants of any kind versus dentures. Your chances of bacteria build up, and gum disease decreases when you have implants. Your other teeth will not be affected because of missing teeth. 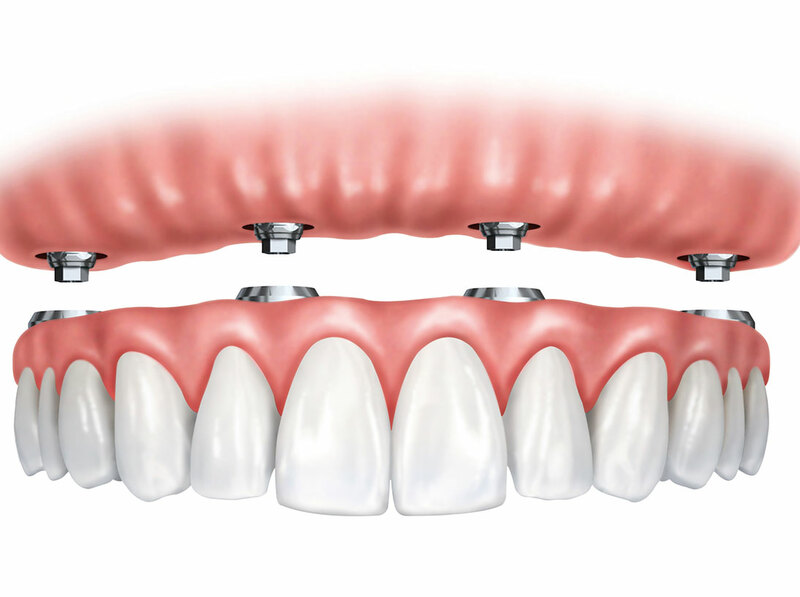 Since replacing missing teeth with implant supported crowns and bridges do not involve the adjacent natural teeth, they are not compromised or damaged.